Over the past few years, the NBA 2K franchise has solidified its reputation as one of the premier sports simulations. Packed with well-crafted game modes, best-in-class presentation, and entertaining-yet-deep gameplay, NBA 2K12 was the best sports game of last year. Instead of taking a post-release victory lap, developer Visual Concepts scrambled to address the rampant connectivity issues online. Broken matchmaking, frequent disconnections in the middle of games, and heavy lag ultimately damaged the reputation of the otherwise stellar game. Visual Concepts used the offseason to work on its weaknesses, but in doing so neglected some of its strengths. This series has never been touted for its robust online offerings, but after an off year, the performance rebounds into the realm of acceptability. The Online Association improves by giving admins more options to run leagues with their preferred settings. In standard head-to-head match-ups, I occasionally experienced lag and dropped matches, but the performance improved for the most part outside of a fourth quarter bug that causes the scoreboard to disappear. NBA 2K13 lacks a dedicated player vs. player league like NHL’s EASHL (a major missing piece for a sport that's perfect for this kind of mode), but at least you can play three-on-three pickup matches on the blacktop with your MyPlayer. Instead of building a fully featured multiplayer mode, Visual Concepts spent its time creating MyTeam, a mode that operates similarly to EA’s Ultimate Team. Starting with a squad of scrubs, your goal is to build a team of NBA superstars by spending virtual currency (VC) or real money on players or booster packs. The VC also extends to modes beyond MyTeam. Whether you’re playing Association mode, MyCareer, or taking on competitors online, you’re racking up VC that can be used to upgrade your skill ratings for your MyPlayer or buy new signature skills, animations, and clothing. NBA 2K13 tallies VC totals online, so no matter what mode you are playing the game needs to interface with the servers. When the game launched, it suffered from connectivity issues that resulted in me losing VC and the results of the Association games I just played. Visual Concepts has since tweaked the servers to prevent this from happening. Even when games are recorded appropriately, Association mode hasn’t moved the needle much. Several of the core concepts, like coach-defined roles determining player happiness, the trade finder, and the NBA Today interface, lay the foundation for a good experience. Sim fans will appreciate the ability to determine their teams’ first three scoring options with the new Total Sim Control feature, but other core pieces, like the NBA Draft and player free agency logic, need renovation. You have no way of advancing the draft to your pick, and you’re not given access to scouting information until your pick is up, which hinders fielding trade proposals. How are you supposed to know whether moving up in the draft is a smart idea when you don’t know which players are still available to select? Most of the player movement in free agency seemed plausible, but several superstars made curious career decisions. LeBron James left the Heat to join a barren Phoenix Suns roster, Carmelo Anthony jumped to Orlando, and Chris Paul ditched L.A. for Detroit – all highly questionable choices for star players overtly concerned with winning championships. Purists may also decry the lack of some new collective bargaining clauses, like the ability to “amnesty” players with bloated contracts. My favorite way to play NBA 2K13 is My Career, the single-player mode that tasks you with writing your legacy on the hardwood. New changes like virtual Twitter followers, the ability to build your own custom Nike shoe once you become a superstar, and meetings with the general manager that allow you to air your grievances give it more depth than similar modes in other sports games. Becoming a game-changing player early in your career is also easier since you accrue VC outside of the mode. NBA 2K13 still features a vast selection of classic teams and players (including the Dream Team), but unfortunately it doesn’t provide a dedicated historical mode like the past two years. If you want to play with these teams, you need to do it in exhibition or online games. On the court, this game performs like a perennial all-star. 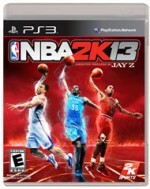 Taking a page out of EA’s playbook, NBA 2K13 relocates dribbling moves to the right analog stick. Transitioning to this new control scheme takes practice – I commonly found myself tapping the right analog stick to enact a shot (which now requires a left trigger modifier) – but once you get used to it you’ll be breaking the ankles of defenders and bursting to the basket with the skill of an elite shooting guard. In fact, scoring on the default difficulty setting in NBA 2K13 is easier than ever. To make the game more accessible to the mainstream, Visual Concepts tuned the gameplay for an arcade experience. Shooting over 50 percent from field is the rule, not the exception, so if you want a more realistic simulation experience I suggest series veterans raise the difficulty immediately. Other gameplay changes, like the dynamic shot generator that produces a rich array of context-sensitive shooting animations, make the action seem less scripted, but several legacy problems for the series resurface as well. Player animations clip through one another too frequently in the paint, too many passes and shots along the baseline clang off the side of the backboard or basket, and players lack basic boundary awareness – all illusion-shattering problems I hoped would have been addressed by now. Visual Concepts used the offseason to work on its weaknesses, but in doing so neglected some of its strengths.